Pickled vegetable tastes good only when it’s fresh and especially healthy for us if there is no alum (phèn chua) added. Actually, refined crystal of alum with a proper amount is okay with our health. However, the point comes from the customers, who usually require crunchy pickled veggie. That’s the reason why merchants use lots of alum, most of that alum used are not refined and thus, harmful to our health. If you live in Vietnam, you can see that pickled vegetable is everywhere in every meal. Look at Nuoc cham (fish sauce) of Bun cha (Grilled meat dish in Hanoi) or of the most famous springroll, you easily find these pickled carrots and papaya. The sour and sweet flavor of pickled vegetables help the foodie balance the taste of the oily meat. 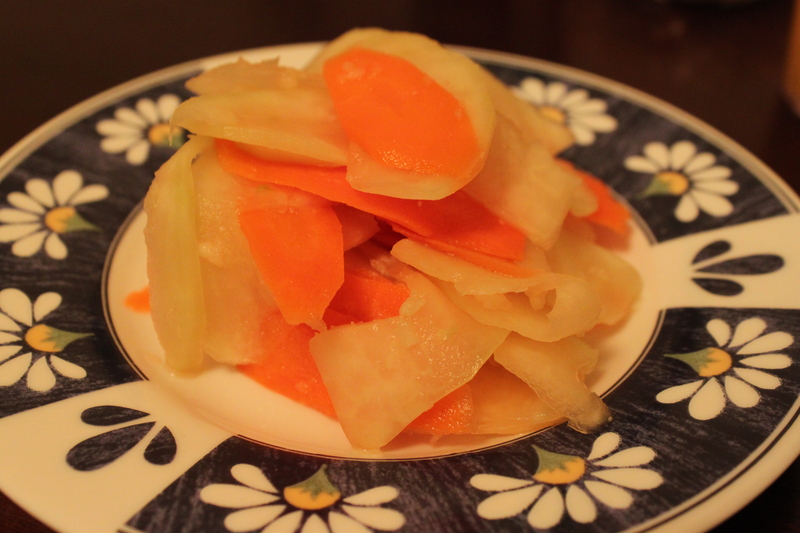 – Use a mandoline, slice the papaya and carrots into thin slices. You can use a knife instead, but your knife has to be sharp. – Sprinkle salt on the vegetables and sit them for 1 hour. – After 1 hour, squeeze all the excess water from the vegetables. Put them in a clear bowl. – Combine all the seasoning (with chopped pepper if you like) and pour the seasoning mixture in the vegetables. You finish your action here. – Let the vegetables sit in room temperature for at least 2 hours before serving. After 1 day, keep the pickled vegetables in the refrigerator. The pickled vegetables would be sour fast in a hot day. – Papaya and carrots can retain their crispy for 10 days without using any alum. This entry was posted in vegetables, Vietnamese and tagged vegetables, vietnamese. Bookmark the permalink. Thanks for your compliment. I’ll make more diet meals next time definitely.